Pac4Portugal are proud of the addition of Casa Caravela to “Whole Property Package”. The new owners completed their purchase of this stunning villa last week and we are now working hard to get it ready for 2017 rental season with full support from our management, rental and accounting services. Casa Caravela is a fantastically positioned 3 bedroom, 3 bath/shower rooms with lovely 8m by 4m heatable swimming pool, good terraces with sea views. Perfect for watching the world go by and just a few minutes walk into the center of Carvoeiro. Located near to Carvoeiro Church at Cerro dos Pios. Perfect for watching the world go by and there will be no need to hire a car as you will be close to everything that Carvoeiro offers: a large number of quality, good value restaurants, bars and shops as well as the lovely beaches. In the high season (June-September) there is also live entertainment in the village square. However if you wish to explore the Algarve further then we can assist in hiring a car or arrange airport transfers as required. Although the pound continues to slump against the euro, we have seen an increased number of villa rental bookings for 2017 season. Those of you who have been slow out of the starting blocks may have already missed your favourite villa for your preferred weeks. Also our stunning Villa Mediterraneo is due to be affected by building work in the area, but with a 15% discount off normal prices it has already started to book from April 2017 onwards. We do have some villas still with good peak season availability, but these will fill, even they start slower than others. Also we are awaiting the arrival of couple of new properties to our portfolio. In 2016 Pac4Portugal finished building the first of number of large villas for our rental Portfolio. We are please to welcome the addition of Casa Altojo to our portfolio for 2017. If you are traveling from outside of Europe or on a multi destination holiday this summer then you are probably looking for a 4 or 5 night stay. The majority of properties will not offer this possibility, however at Pac4Portugal we have selected properties that will meet your needs our of peak and a limited number that will offer in peak times. Our property rental section of Pac4Portugal was established initially in February 2006, some 10 years ago, under http://www.villa-in-carvoeiro.com. We thought about what we disliked when booking our own holidays and how we could improve this. We hated booking a holiday and when speaking to the travel agent you knew they were just reading from a brochure. So 10 years ago our first and foremost objective was to deliver personal service while utilising our local knowledge. For us it is important that we get to know the properties we are advertising, along with the surrounding amenities and experiences. We encourage all our clients to ask as many questions as they need before booking, we want you to be happy with their choice and in addition we offer more reassurance by letting you know part of the Pac4Portugal Team we be personally meeting you during your holiday. In 2014 Pac4Portugal.com was launched as a more professional way to advertise. Our websites have never been searchable by date or for clients to book directly on them. We want our clients to contact us with their requirements and then we can advise them of the best options available and tailor make their rental requirements. Is it just the English that we cater for? Property owners ask us whether we only market to the English clients, the simple answer is no. 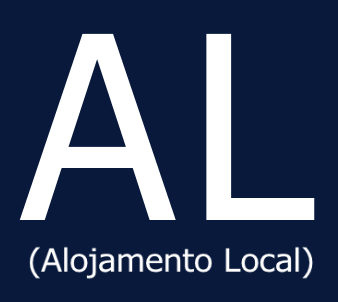 Although our website is in English, our team in Portugal is multi-lingual and we advertise in Portugal in 2-4 languages as we recognise our extended market. We accommodate clients across Europe (UK, Ireland, Sweden, The Netherlands, Germany, France, Italy to name a few), North America, South America, Asia and Australasia. So pretty much across the world. The use of translate programs on the internet allows us to communicate better with different nationalities. We believe in keeping in contact with as many potential, new and repeat clients as possible. Like many businesses we find social media a very useful and instant way to communicate with them. Our Facebook page is updated on a daily basis with photos and any news, we have nearly 18,000 followers. We also use twitter, pinterest, instagram and many more, as well as catering for our more professional clients via Linkedin. The Social Media allows us in the peak season to keep our finger on the pulse and share some of our experiences as well as inform people of what is on and any suggestions. Through offering our personal service from day one of contact whether with a rental client or an owner, we start to build a good rapport with clients. Many of our clients become friends over time. Some it is just great to catch up over a cuppa and others out of season we like to share a meal or an experience with them. At Pac4Portugal we are always looking to improve our rental portfolio, services and our clients experiences. Your feedback is important to us both about our services and your rental property. Our aim at Pac4Portugal is make people feel special by helping they book the right properties for their important holiday requirements, as well giving them the local knowledge of the beauty and experiences that Carvoeiro/Algarve/Portugal has to offer. Book your rental property in Carvoeiro/Lagoa/Silves with us once and Pac4Portugal will always then be your (your family/friends/colleagues) first stop on your search for next rental property. If you still looking for a rental property for 2015 season and the above properties do not suit your requirements, then contact us as we still have some villas available. We would like to wish you a Happy Easter, if you are looking for a late deal, then contact us with your requirements and we can see what the best deal we can do for you. We have had a great start to the 2015 Season with bookings and enquiries a lot better than the last few years. However we still have limited availability for July/August 2015, mainly due to the fact we are still continuing to source quality properties to add to our Portfolio. You will see two new villas in our newsletter and one that has returned to the portfolio on Quinta do Parasio. Monte Dourado complex is 95% full already for August 2015 and our private owners are enjoying one the best rental years ever. There is limited availability now throughout the year, with a high number of repeat clients. Casa Figora and Casa Eucalyptus (Caramujeira, Carvoeiro) which we introduced to you in our December newsletter seems to filling an important gap between complete rural villas and those close to the beach. If you want to escape the world, enjoy nature, view the beautiful star filled night sky and spend important time with friends, family or loved ones, then Casa da Terra (NE of Messines) maybe perfect for you. Due to a couple of cancellations Casa da Terra is available in July and August 2015. 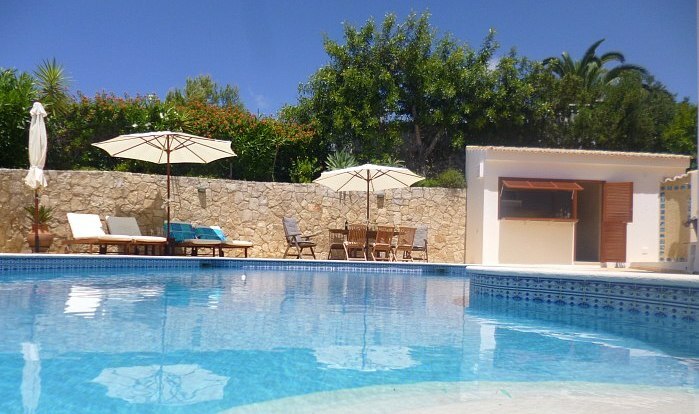 This 2 bedroom villa with pool is just £825 per week and sleeps up to 4 people. 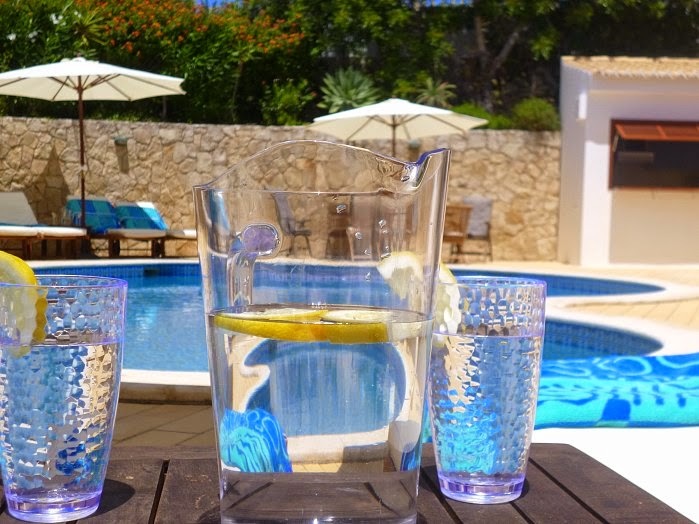 June is a beautiful month in the Algarve and coincidentally we only have availability now in June for Casa Bella Vista, a stylish 4 bedroom villa in Areias Dos Moinhos, Carvoeiro. Offering outside a large pool with high quality outdoor furniture, lawn area, electric gates and inside WiFi and aircon, sleeping up to 9 people. Are you travelling to Carvoeiro to attend a wedding this year? Then we have a couple of villas close to the Tivoli that maybe perfect for you, Casa Trevo and Casa Filarte. The upgrades on Casa Comprida, Casa Birgitta and Casa Solfeiras are due to be finished for the beginning of May ready for our first rental clients in both. Unfortunately the company that we worked with for airport transfers last year is now no longer trading, however do not worry as we have already found another company to offer as good or even better airport transfers. 1-4 people is 65€ each way and 5-8 is 70€ each way, however at this time we cannot offer free supermarket trip. We are busy trying to source local transfer business to cater for your needs while you are at your property. We will keep clients informed through our social networking and website. Pac4Portugal.com has been evolving over the last couple of months; many of you will know we like to be proactive. We have just launched our first version of a smart phone friendly website and it is being received well. In addition we have successfully partnered up with an Algarvian business to start launching Pac4Portugal branded property management services; this is a natural progression for our business to help deliver service. Furthermore, we can offer new build projects for those looking to have their very own second home/rental investment. If you are looking to buy a property already constructed or would like to source land and build then contact us with your requirements. Believe it or not enquiries and bookings for 2016 have already started. But before 2016, we are looking forward to 2015 season and meeting both our repeat clients and our new clients. Villas close and within easy walking distance of the Carvoeiro centre are highly sought after from families with teenagers. You know if you have teenagers they are going to want to explore the town and probably at hours that do not suit your sleeping patterns. We have lots of clients looking for properties that are in easy reach of the center with a relatively safe walk to and from the property. On Pac4Portugal we have small number of villas that meet these requirements! Casa Solfeiras is a 3 bedroom villa that suits the more budget travellers at just £895 per week in July and August, located 10 mins walk into the town and close to the Solferias Hotel.